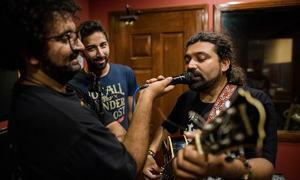 When we talk about the complete lack of classical orientation of our modern music-makers, the only veritable yardstick employed to compare their music with enduring melodies of yesteryears is the intense emphasis then placed on basing popular music tunes on classical ragas. We need to appreciate the fact that the outstanding virtue of the golden era of popular film music was that it contained indelible marks of traditional classical genres. The epitome of evergreen music of the past was Naushad Ali, fancifully known as Sangeet Samrat (Emperor of Music), who is ranked as one of the most successful and revered music directors of popular film music and left a lasting impact on it. It is widely recognised that Naushad gave a new trend to popular film music by basing his tunes on classical music. When he rose to prominence, the influence of western music was quite strong on indigenous musical styles as the British Empire ruled the roost and the local film industry was following the westernised system of making films and scoring music. During his initial phase in the trade, Naushad’s compositions were also tilted towards European orientation but he soon made a clear break with it and based his tunes on classical music, taking special care of the sur and nuance of a raga. The quality and affectivity of the music Naushad brought to fore will become manifest when some of the compositions of the maestro are analysed in the light of ragas they were based on, transforming his numbers into gems of popular music. Naushad in his composing career spanning 65 years (1937 to 2005) scored music for 65 released films with 636 songs to his credit; 373 solos, 115 duets and 148 chorus and mixed numbers. He achieved quite a phenomenal record of success as 19 of his films were rated as silver jubilees (running 25 weeks), eight golden jubilees (running 50 weeks) and six diamond jubilees (running more than 60 weeks). 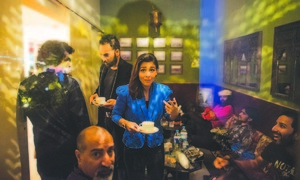 Naushad came to the limelight by scoring music for film Rattan in 1944 produced by Lahori film icon Abdul Rashid Kardar, cousin of Pakistan’s first test cricket captain Abdul Hafeez Kardar. The success of film music of Rattan could be gauged from the fact that with a budget of 75,000 rupees the film’s music grossed over 200,000 rupees only from the sale of gramophone records. Five of its songs sung by Zohrabai Ambalewali and Amirbai Karnataki – Ankhian milake, Oh janewale balamwa laut ke aa, Rimjhim barse badarwa, sawan ke badlo and Milke bichad gayien ankhian – and written by Gujranwala-born DN Madhok became cult songs later to be remixed frequently. Naushad also scored music for film Anmol Ghadi in 1946, catapulting Noor Jehan to stardom. He not only based his compositions on rather easy to render traditional ragas like Pahadi, Aiman, Darbari, Kafi or Des, but also ventured into cumbersome and unconventional raagic interpretations such as Jaijaiwanti, Kedara, Brindabani Sarang, Bihag, Durga, Kirwani and Kalavati. The maestro adhered to his raga-based musical journey right to the end and very rarely wavered from it. His contemporaries like Anil Biswas, C Ramchandra and SD Burman were willy-nilly compelled to follow his lead and in the process created tunes which refuse to lose their luster, proving the point that classical music base is supreme whether it be western or eastern. Right from composing Rimjhim barse badarwa in raga Pahadi in film Rattan effortlessly rendered by Zohrabai Amabalewali, Naushad emphasised the durable value of classical mores. Pahadi is symptomatic of unbounded energy emanating from the hills and mountains of northwestern parts of the Subcontinent and is widely known as the patron raga of Punjab. It is usually sung in the middle or low octaves (subtak), embellishing its effect. This composition was later on sung by Nayyara Noor along with other songs of film Rattan. His most durable composition Suhani raat dhal chuki was shaped in Pahadi and was from film Dulari made in 1949 that became legendary and is still considered an integral part of any singer’s repertoire in any musical gathering. In 1946, Naushad gave music for Anmol Ghadi in which his composition Jawan hai mohabbat set in Pahadi and performed by Noor Jehan turned into a rage. His other popular number in Pahadi was Tod diya dil mera composed for film Andaz in 1949 and rendered by Lata Mangeshkar. Naushad also utilised Pahadi to create an amazingly profound tune Marna teri gali mein for film Shabab in 1954 sung by Lata with unusual pathos. Naushad based all of his matchless compositions on ragas prepared for film Shahjehan sung by Kundan Lal (KL) Saigal which are considered classics in popular film music. Naushad tuned his very fine number Jab dil hee toot gaya in raga Bhairavi in a manner that this raga became his signature tune as Naushadian Bhairavi. Bhairavi is a sampooran raga in which all notes, komal (soft) and teevar (sharp) are utilised creating an unparalleled harmonic sequence. In the northwestern part of the Subcontinent, Bhairavi is rendered in Sindhi ang (nuance) and exerts quite an influence on folk music. The quality of Naushadian Bhairvi is that it is immediately recognisable. It is amply reflected in his beautiful compositions such as Tu ganga ki mauj mein for film Baiju Bawra rendered by Rafi that became the standard bearer for flowing rendition based on classical ragas. Another of his hit songs was Toote na dil toote na picturised on Dilip Kumar in Andaz in 1949 and sung by Mukesh, then considered Dilip Kumar’s screen voice. One exceptional tune composed for 1951 film Deedar was a duet sung by Lata and Rafi Dekh liya maine qismat ka tamasha whose tragic notes still evoke passion. Naushad was mindful of the consummate singing skills of KL Saigal and gave him his rather unconventional raga Bihag tune Ae dil-e-beqarar jhoom, an extremely lilting number majestically rendered by Saigal in his inimitable deep voice. Written by Majrooh Sultanpuri, this song contains pieces of verse rendered by Saigal in the dialogue method. Bihag is a late evening raga in classical singing but is not very common in semi-classical genres. In classical music it is regarded as filled with Shringara rasa (romantic sentiment) and is often sung in thumri style. 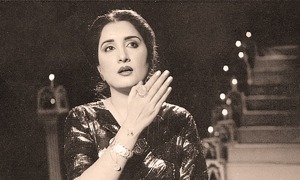 Ustad Bade Ghulam Ali Khan’s thumri in this raga, Lat uljhi suljha ja re balam was also ventured upon by many music directors in different variations, particularly Rasheed Attre in Pakistani film Sawal sung by Noor Jehan. The unmatched timber of Saigal’s voice appears supreme in Naushad’s exquisite raga Kafi-based song Gham diye mustaqil itna nazuk hai dil yeh na jaana. Kafi is quite unique as it is a raga as well as a thaat (mode) and is sampooran in nature using all seven notes in ascending and descending order. Kafi is a versatile raga and can be played anytime. It has tremendously influenced folk music though its pure classical forms are rarely performed. Naushad’s two exceptional numbers in raga Aiman (also known as Yaman) were from K Asif’s opus Mughal-e-Azam, Humein kash tum se mohabbat na woti, composed in 1960 and sung by Lata, and Jaane wale se mulaqat na hone payee also sung by Lata and composed for Mehboob Khan’s powerful drama Amar released in 1954 that reduced the film’s heroine Madhubala to tears. Aiman is quite simple as a tune and is usually the first lesson taught to learners of classical music. The shudh (pure) notes of the raga convey a feeling of resigned tranquility. Naushad composed a very poignant tune in raga Durga for film Uran Khatola in 1955 that was rendered by Rafi. Durga lends itself beautifully to any time of day and to both slow and lively tempos. It is a raga conveying innocence and purity. Look at the way Naushad turned it into a haunting composition O door ke musafir hum ko bhi saath le le re for Uran Khatola that still retains its freshness. Another composition of Naushad was in raga Bahar, a very popular springtime melody. It is an upper-part-of-the octave raga and is adept at combining with several others to form jod, or compound, ragas — challenging to perform but all the more rewarding to listen to when executed by masters. Part of the lore surrounding the raga is that Amir Khusrau introduced Bahar in music. Naushad created one outstanding melody in Bahar, Man ki been matwari baaje, sung by Rafi and Lata for film Shabab that is full of mellifluous notation. Naushad created three outstanding melodies in raga Pilu, a light classical raga or thumri that is quite varied and like Bhairvi uses all notes in rhythmic sequence. Representing verve and devotion it is very suitable for conveying feelings of attraction. Moray Sayyanji Utrenge composed for film Uran Khatola is full of such a joyful anticipatory emotion. Mera pyar bhi tu hai prepared in 1968 for film Saathi sung by Suman Kalyanpur and Mukesh conveys romantic devotion and Na maanu na maanu na maanu re rendered by Lata in film Gunga Jumna in 1961 is a teaser all the way. A late night, raga Darbari, is said to have been created by Mian Tansen in the royal court of Emperor Akbar. The raga requires "andolan" or "light oscillations" of its middle notes komal ga and komal dha to create a profound impact. Naushad used Darbari to create a Muslim devotional number Beech bhanwar mein aan phasaa hai dil ka safeena, Shah-e-Madina, for film Dard in 1947 for Surraya to render it. Similarly, he composed a devotional song O dunya ke rakhwale for 1952 film Baiju Bawra very effectively sung by Rafi which became his benchmark for unalloyed success. Tilang is a flexible raga and the simplicity in its tonal patterns and easy note combinations makes it an ideal scale for melodies. Naushad created two very soulful tunes in raga Tilang: Yehi arman lekar aaj apne ghar se hum nikle, a meaningful ghazal admirably sung by Rafi for film Shabab in 1954 and a fluent Qawwali, Mein idhar jaoon ya udhar jaoon, for 1967 film Palki rendered by a bevy of acclaimed singers such as Rafi, Manna Dey, Asha Bhosle and Aziz Nazan, an accomplished qawwal in his own right. Naushad composed two sequentially modulating numbers in rather unconventional raga Jaijaiwanti whose notes are considered more suitable for classical singing. Jaijaiwanti belongs to Khamaj thaat and is usually sung in the evening between 6:00 pm and 9:00 pm. Naushad used it for film Andaz in 1949 and composed Hum aaj kahin dil kho bethe poignantly sung by Mukesh. The other song was Mohabbat ki rahon mein chalna sambhal ke composed in 1955 for film Uran Khatol a that was playfully performed by Rafi. Raga Kirwani is a South Indian melody that is sampooran in content . The melody is heart-rending and is used to convey sentimental devotion. Naushad employed it to compose the mesmerising 1949 film Andaz’s song Tu kahe agar jeevan bhar mein geet sunata jaoun rendered by Mukesh. Mehdi Hasan also sung a famous Ahmad Faraz ghazal Shola tha jal bujha hun hawaien mujhe na do in raga Kirwani. Naushad composed a tonally infectious composition in raga Kedar, Uthaye ja unke sitam , sung by Lata for film Andaz in 1949. 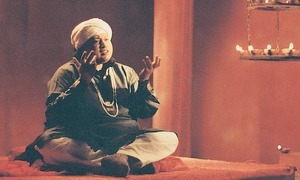 Kedar is a master’s raga as it is used to sing dhrupad, khayal and thumri. It contains all elements of classical ragadari and its abstract nature makes it difficult to capture its spirit as it is far more complex to sum up all its tonal clusters, but in the experienced hands of Naushad it became putty. A very endearing tune that Naushad composed was to convey the feeling of anguish of a broken heart in film Shabab made in 1954. The song Jo mein jaanti bisrat hain sayyan ghungtaa mein aag laga deti was based on raga Maand, a light but effective melody conveying a variety of emotions and mostly sung in folklore of northwest of the Subcontinent. This song recaptures the anguish that Amir Khusrau felt at the passing away of his murshid Hazrat Nizamuddim Auliya. Naushad asked his songwriter Shakeel Badayuni to write the folk legend in Bhojpuri dialect and raised it to perfection with very sombre notation. In the same film, Shabab , Naushad utilised rather tricky raga Brindabani Sarang to write very sweet Jogan ban jaongi sayyan tore karan sung by Lata. Belonging to the family of Sarangs, Brindabani Sarang is a member of the Kafi thaat and is usually sung during the midday period and its tonal mood exudes profound quiet and peace. The Sikhs often use it for their religious shabads and ashlokas. Another difficult melody Naushad composed was Aaye na balam wada kar ke rendered by Rafi in raga Gaud Sarang. Gaud Sarang is a typical scale with zig-zag melodic movements. Its quality is that it can bring about a serious mood when performed in slow tempo, but can evoke energetic hope in medium fast tempo. One of the exceptionally brilliant compositions of Naushad, Madhuban mein radhika naache re, famous for an excellent Sitar sequence, for film Kohinoor in 1960 was laid out in raga Hameer, which is very rarely used for light music. Hameer, part of Kalyan thaath, belongs to the class of ‘big’ ragas and is known to project a vigorous, dramatic mien. It can characteristically accommodate a variety of dhrupad and khayal styles. Another unusual raga Naushad used for composing absorbing ghazal Koi Saghar Dil Ko Behlata Nahin was Kalavati implying kala or arts that is a modern pentatonic raga. This composition was done for film Dil diya dard liya in 1966 and was highly praised for its profound originality . 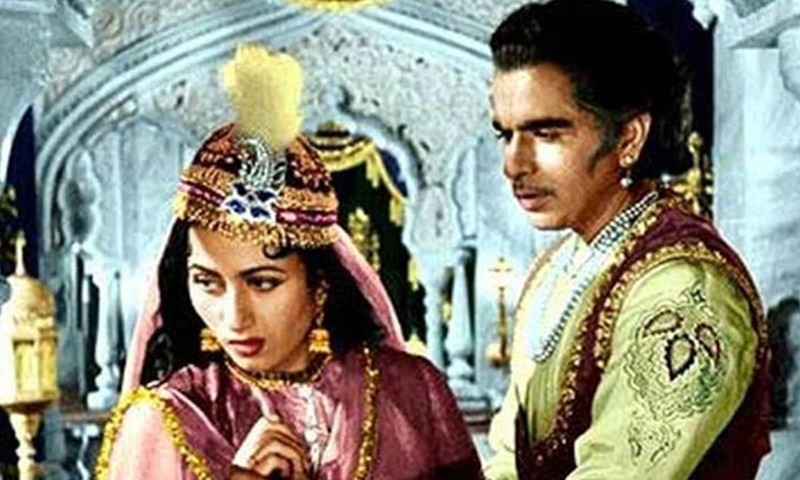 Naushad’s highly acclaimed dance sequence composition Mohe panghat pe nandlal chere gayo re recorded for film Mughal-e-Azam in 1960 was competently sung by Lata. This song was composed in rare raga Gara that is an independent raga as well as an additive corollary to other ragas. Usually considered time-neutral, Gara is defined by its melodic informality that makes it hard to pin down. Mohammed Rafi became a singing star by singing Man tarpat hari darshan ko aaj, a complicated semi-classical composition based on raga Malkauns for film Baiju Bawra released in 1952. Naushad realised the intricacies of this five-note raga belonging to Bhairavi thaath in which rikhab (re) and pancham (pa) are prohibited. The cumulative impact of the raga is supposed to be darkness and secrecy. It is considered to possess supernatural powers and is supposed to conjure spirits. Mehdi Hasan used to sing one composition of Naushad, Husn walon ko na dil do yeh mita dete hain, pragmatically rendered by Talat Mahmood for film Babul released in 1950 . This song was composed in Bhimpalasi, a raga that suits hot sub-continental climate and is part of Kafi thaat. Its tonal inflections are the result of its five ascending and seven descending notes. Mehdi Hasan also sung his extremely melodious Ghazal Zindagi mein tau sabhi pyar kiya karte hain in Bhimpalasi. Naushad composed an intricate melody for film Mere Mehboob in 1963, Yaad mein teri jag jag ke hum raat bhar karwatein badalte hain. This number is based on raga Darbari Kanada known as a musical entity with controlled power, philosophical depth, emotional richness and regality; and its majestic intonation carries in its wake therapeutic effect. The tonal inflections underpinning classical music of the Subcontinent contain a plethora of melodic surprises very well balanced by Naushad. The secret of his success was his employment of exquisite notation helped by consistent rhythmic sequence, a pattern inherent in classical music. The high level quality of his compositions was hidden in their melodic flow and adroit modulation. Our young composers would do well to emulate Naushad’s emphasis on the traditional reservoir of our classical music. An earlier version of the article stated Mohe bhool gaye saawariya sung by Lata for film Baiju Bawra in 1952 to be in raga Bhairvi. It is, however, in raga Bhairav, which is a different raga. The author would like to thank the reader who pointed this out. The author is an avid music aficionado who figured out the ragas mentioned in the piece on his harmonium. he was the greatest music director of the subcontinent.icannot think of any of films failed because of his music! He was great music director India had and not seen yet any one to match his kind of music.People will remember his evergreen songs and music for very long time. He belonged to my city...Lucknow. Lived in Aminabad. Did what he wanted to do most. He conjoined Awadhi and Punjabi folk music in his composing. Used ragaas in every composition. Did not compromise with his belief. A very good Urdu poet. Extremely gentle. Success never over-boarded him till his heavenly abode. He was Kohinoor of this sub-continent. His music is property of India and Pakistan alike. We must share his legacy with proud. When it comes to great hindi film songs based on indian ragaas then nobody can beat Naushad. So many songs over 60 years old but even the young indians know these songs. Great music director. Naushad...Bus naam hi kaafi hei. He was a genius of playback singing compositions. one of the people who has set the framework for film music that is still being used. The only composer who never had Kishore Kumar singing to his tunes. Great piece on classical anchoring of film music. The learned author, however has mistaken ""moray Bohol Gaey sanwaya" to be based on Bhairveen. It is based on "Bharon", a totally different raag from a different thaat. Thank you author for such a wonderful article. Naushad saab was a genius. His classical composition "Aaj Gavat Man Mero" from Baiju Bawra in Raag Desi which had Ustad Amir Khan versus Pandit D V Paluskar in a duel is priceless. He also got Ustad Bade Ghulam Ali Khan to sing in a film for the first time in Mughal-e-Azam where he sang two beautiful classical compositions. Wow - what a beautiful and comprehensive review of the works of the great Naushad Ali! Many thanks. The great Naushad who has innumerable hit songs to his credit. His first film as music director was Kardar's Dard. He was once assistant to another legend Kemchand Parkash even though he had established himself as leading music director. In film Mahal, he was assistant to Kemchand Parkash. Songs from Deedar, Baiju Bawara and Mughle Azam and other films are still popular. Lovely presentation of a musical genius. There is not one occasion in the daily lives of people which is not musically presented, from birth to death and after there is music that envelopes the soul of people. It is a marvelous write up. Error in my earlier comment. Dard was not Naushad's first film rather it was the first for Shakeel Badayni and then together this due went on to give us memorable hits. Thank you very much, M A Siddiqi ji and Dawn for a beautiful, beautiful trip down memory lane. Five decades or so later, I got to relive "mere bachhpan ke din." Those were the days my friends, we thought they'd never end. Very good article on our musical heritage. Apart from Naushad, C Ramchand, S D Burman & Shankar Jaikishan also created memorable songs using Classical Raga. Shanka Jaikishan's favorite one was Shiva Ranjani and a song from Mera Naam Joker "Jane Kahaan Gaye Woh Din" is a testomony to his brilliance. Kalyanji anandji used Kalyan and Lakshmikant Pyarelal used Pahadi.